Soraa, the world leader in GaN on GaN™ LED technology, announced that its LED lamps have been installed at the new Yauatcha City restaurant. Officially open the summer of 2015, Yauatcha City is a unique, contemporary dim sum teahouse that is lit to create both a sense of drama and intimacy for the restaurant patrons. Paul Nulty Lighting Design (PNLD) chose Soraa LED lamps because of their unique quality to deliver perfect rendering of colours and whiteness. Soraa LEDs create a dramatic lighting environment that is consistent with Yauatcha City’s identity and characteristics. The restaurant’s architectural details include bespoke bone white china pendants that use Soraa lights to illuminate each seat individually. Soraa downlight LEDs create the drama in the restaurant’s starlit ceiling and illuminate the beautiful, blue glass balustrade. Soraa’s unique GaN on GaN™ LED technology allows its LEDs to operate at currents that are more than five times higher than LEDs built on other materials. This means a lot of light comes from a very small source, resulting in a narrow beam of light from one source. This elegant LED design provides crisp object definition with a single shadow. Soraa’s Violet-Emission 3-Phosphor (VP₃) LED technology allows for perfect rendering of colours and whiteness. Utilising every colour in the rainbow, especially deep red emission, Soraa’s lamps render warm tones beautifully and accurately, and achieves a colour-rendering index (CRI) of 95 and deep red (R9) rendering of 95. And unlike blue-based white LEDs without any violet emission, the company’s lamps have violet emissions to properly excite fluorescing brightening agents, including natural objects like human eyes and teeth; as well as manufactured white materials such as textiles and paper. 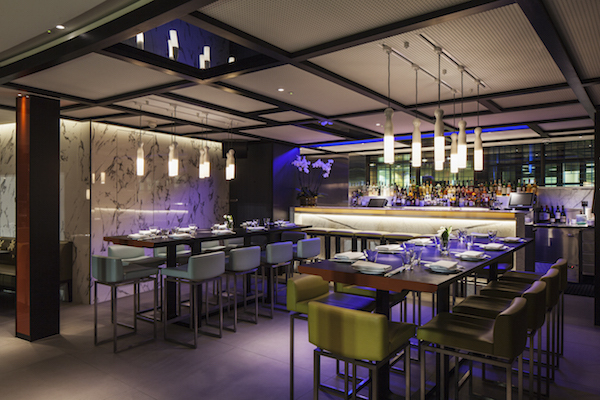 “With the restaurant’s unique shape and exclusive location in London’s recently redeveloped culinary destination, Broadgate Circle, Yauatcha City is unlike any of the other restaurants. Lighting is always a critical element in our restaurants and Soraa LED bulbs with their GaN on GaN technology provide us the best balance of colour consistency, environmental consideration and product longevity” said Bruno Veninga, Head of Architecture and Interiors at Hakkasan Group, which owns Yauatcha City restaurant. Hakkasan Group is a leader in global hospitality, dining, nightlife and entertainment. This is the second Yauatcha in London, following the success of the company’s Michelin-starred restaurant in Soho.